That historical misuse, however, doesn’t justify the unjust writhing and screaming being thrown towards Folau. None of this justifies dehumanizing a man and taking away his bread and butter. None of this justifies any corporation such as Qantas, bullying, via economic sanctions, companies they do business with, such as Rugby Australia. As I noted a few days back, Folau quoting from the Bible on his own personal Instagram page, is between him, Instagram and those who follow his social media account. It doesn’t involve the R.A, the L.G.B.T lobby or even Qantas. As Jean Bethke Elshtain once said, ‘when we start to regard ourselves in our own light, our light dims’. God does not take pleasure in the death of the sinner, but rather that the sinner should turn from his and her way and live (Ezekiel 18:23). We hear the Old Testament prophets reminding us that the world must not fall into ignorance and complacency. The pain and suffering of history is broadcasting warnings into the present; warnings about the ensuing calamity caused by ideological crusades that have enslaved men and women, under the promise of establishing ‘God’s Kingdom without God in it’. Alongside uncompromising words from Denzel Washington, the unapologetic resilience of Candace Cameron-Bure, Patricia Heaton, Kevin Sorbo, and even Mark Wahlberg, it’s comforting to know that not all of Hollywood is lost in a sea of ideological serfdom, sensuality, greed and opportunism. Here’s a brief transcript of an excerpt from Jim Caviezel’s speech given to The Fellowship of Catholic University Students (F.O.C.U.S), on Jan. 5th 2018. Caviezel ‘s speeches are usually deep. He’s well prepared and speaks with conviction. His talk here is no different, and it shows that Caviezel needs to step up and speak more often. “After shooting Monte Cristo I inexplicably get a call from Mel Gibson. My agent didn’t call. My manager didn’t call. I didn’t know Mel Gibson. I wasn’t politicking for the role because nobody knew it was happening. Gibson wanted me to play Jesus Christ. He wants the guy with the initials of JC, who just happens to be 33 years of age, to play Jesus Christ. Is that a coincidence? I don’t think so. Is your life a coincidence or is it all just a chance? Some of you may be miserable right now, confused, uncertain of the future, hurting. This is not the time to back off; or to give in. When I was up there on the cross, I learned that in his suffering was our Redemption. Remember the servant is no greater than the master. Each of us must carry our own cross. There is a price for our faith, for our freedoms. I have been literally scourged. Hit by the whips. Crucified, struck by lightning; yes, open-heart surgery – that’s what happens after five and a half months of hypothermia. One day, during this shoot, my arm was wedged under that heavy beam, when someone yanked it in the other direction. My muscles wrenched, my shoulder separated, I fell to the ground. Dropped my head into the sand, this take now remains in the movie. In the later part of the film, Jesus experiences a shoulder separation, well I now know what that felt like. Every day I had to pick up that thing. It was like a penance. It ripped into my shoulder, tearing up my flesh, and with each passing hour, it got heavier. Had this been shot in a studio, you never would have seen that performance. The suffering made my performance; just as it makes our lives. Some of us now (and you know them) embrace a fake Christianity, where it’s all happy talk. I call it happy Jesus and glory. Guys, there was a lot of pain and suffering before the resurrection. Your path will be no different, so embrace your cross and race toward your goal. I want you to go out into this pagan world. I want you to have the courage to step into this pagan world, and shamelessly express your faith in public. The world needs proud warriors, animated by their faith. Warriors like Saint Paul and St. Luke, who risked their names, their reputations, to take their faith, their love for Jesus, into the world. God is calling each one of us; each one of you to do great things, but how often we failed to respond; dismissing it as some mental blurp. It is time for our generation now, to accept that call. The call of God urging all of us to give ourselves entirely to him, to see that gentle hand, guiding your path, but you first make must make the commitment, to start praying, to fast, to meditate on the Holy Scriptures, and to take the holy sacraments seriously; for we are a culture now in decline; a people in danger of succumbing to our excesses. Our whole world is entrenched in sin and they’re in the quiets our hearts, God is calling out to us, each one of us, to give ourselves entirely to him, and how often we ignore him; ignore that sweet call. The great saint of Auschwitz St. Maximilian Kolbe said that, “indifference is the greatest sin of the 20th century”. Well, my brothers and sisters, it is the greatest sin of the 21st century as well. We must shake off this indifference! This destructive tolerance of evil, only our faith in the wisdom of Christ can save us, but it requires warriors ready to risk their reputations, their names, even our very lives, to stand for the truth. Set yourselves apart from this corrupt generation. Be saints. You weren’t made to fit in. You were born to stand out. For in our country now we are only too happy to go with the flow. We have a shrine to freedom now where all choices are equal, no matter what the consequences are. Do you honestly think this is true freedom? Pope John Paul the great said, “Democracy cannot be sustained, without a shared commitment to certain moral truths about the human person in the human community”. The basic question before a Democratic Society is this: how ought we to live together? Seeking an answer to this question: can society exclude moral truth and moral reasoning? Five key statements by Barth in C.D 2:1 help to deliver a better understanding of his belief that ‘sin can only ever be the impossible possibility’ (p.505)[i]. In God permitting us to respond to grace, the rejection of grace [sin] is made possible. Essentially, this is the possibility of self-annulment; the rejection of our own existence, primarily attached to an outright rejection of God’s. Fifty pages on and the idea pops up again. Finally, Barth claims that although God is omnipotent, omnipresent, and omniscient, God is not the author of defects. He is not the author of sin. In creating the possibility of a human response to grace, God also grants us along with the answer to sin, the possibility to sin or not to sin. God is not, therefore, the author of sin. God hasn’t changed: He wills to be with us and that we should not be without Him[ii]. God does not will that we should be puppets. Even though God in His power is capable of commanding puppets, for Him to do so would be inconsistent with who He is and has revealed Himself to be. In His loving freedom and patience, He allows. This allowance is His will; a gracious permitting that does not desire the absolute rejection of Himself. Nor does He desire the total annihilation of His creature. The impossible possibility is a human paradox. The battle against sin is, in Christ, won. Sin has been answered by the holiness and grace of the free and loving God. Yet, sin still oppresses humanity. In it a state of deceptive revolt exists against the omnipotence, knowledge and will of God. The consequence of possibility rests on God’s omnipotence and constancy. God acts in freedom and in condescending gives humanity the gift of freedom[iv]. Put simply: That we have an empowered freedom not to sin, means we ought not to sin. That God has already acted means we can act. That we can sin, doesn’t mean we should give in so easily to it. Barth’s use of the phrase “fall from God” should not be read as a “fall from grace.” As such, there is no “fall from grace,” but rather only a rejection of it; or the possibility of rejecting it. In this volume of his Dogmatics, Barth outlines that God’s omnipotence and constancy is grounded in the fact that He is the one who loves in freedom. God is free. He gives freedom and that gift of freedom includes the principle of taking responsibility for that gift. The onus of responsibility in freedom falls on men and women, who are recipients of it. God’s gift of freedom means that humanity is held to account for how it employs and has employed that freedom. Because of God’s act in freedom, he is not the cause of all things that contradict or seem to contradict Him; or contradict what God does or who He has revealed Himself to be. What He allows and disallows is to be equated with who He is; ‘the one who loves in freedom’[v]. E.g. : what God does comes from who He is[vi]. On the other hand, what God allows and disallows is not to be equated with what He does. E.g. : God’s disallowing is not His disavowing. The creature in relationship with Him is granted the responsibility to act. Not just the responsibility to act responsibly, but the grace to do so. Instead, we find ourselves contradicted. God’s grace shows us our sin and empowers us towards personal, communal, religious, political and ideological reformation. Since, God has in His freedom lovingly and decisively chosen to save us from ourselves, the capability of rejecting the only genuine source of our true freedom becomes a potentiality, even under grace. God is almighty. God is constant. Humanity changes, the Almighty doesn’t. Humanity enslaves itself, God sets us free. In Jesus Christ, God has chosen not to reject us. Yet, the possibility exists where the rejection of God is made a potentiality. This human rejection contains the possibility of self-condemnation; total extinction – (self-annulment). Any attempts made by humanity to save itself outside of God’s will, furthers this rejection by displacing God with false gods, false religion, false ideologies or idolatry. In the wilful rejection of His grace and self-revelation humanity commits itself to the task of circumventing God and by doing so commits itself the reality and freedom of the impossible possibility. God wills freedom for His creature. This means permission. Risky, but all of this is encompassed within the sphere of God’s omnipotence, omnipresence and omniscience. God is the full-stop. He knows what He is doing. Nothing passes Him. By allowing His creature the freedom to sin, God willed to make it possible for humanity to be free from sin. Subsequently, God desires that we act, in, through and on His grace. Working with Him in participation against that which seeks our’s and our neighbour’s total annihilation. To be so convinced that true reality (or freedom) is existence without the One who birthed that existence, is to give in to an arrogance which rejects grace, and chains humanity to the Dark agenda of total extinction. [i] This is also a phrase repeated by Barth in, Prayer. [vii] Busch, E, Barth (Abingdon Pillars of Theology) Abingdon Press. Kindle Ed. Image is mine. The photo is of the Hunter Valley Gardens chapel in NSW. ‘For nothing is so inconsiderate as sin: nothing so senseless, so utterly foolish and outrageous. All is overturned and confounded and destroyed by it, wheresoever it may alight. Unsightly to behold, disgusting and grievous. Chrysostom was a 4th century Archbishop from Byzantium. My Church history major, is probably the reason for my deep appreciation of this preacher, theologian and the sharp contemporary relevance I find in his writings. I once read the quip: why don’t radical feminists, in the spirit of inclusive language, argue for Christians to stop referring to the devil as a ‘he’? With this in mind, I therefore think that in saying I like Chrysostom’s parallel, I am not reaching beyond the realms of gender equality and inclusive language. The simple truth is that our Christian forebears equated sin with the image of a woman, and the devil with the image of a man. Post-1960’s nothing seems to have changed a great deal in that department. Researching artistic expressions of sin is not an easy task. The reasons for this are twofold. First, while sin is associated with the feminine image, it is also primarily associated with an apple. Understandably, this association reflects the biblical narrative of Adam and Eve, depicted by many artists over the centuries. However, I think this is unhelpful because the image of an apple limits our understanding of what sin is. The use of such an image rarely conveys the same visual impact as say, Chrysostom’s contextualising of sin with the image of the Greek goddess Scylla. In my view, against such a vivid depiction, the apple-as-sin metaphor just doesn’t cut it. – Apple meet Scylla. 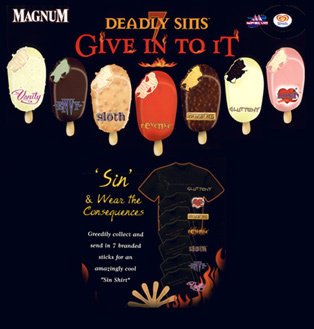 Secondly, sin appears to have been pushed aside in favour of the word temptation. Sin is always attached to temptation, and temptation trumps sin, especially when it comes to understanding “who’s on first”! Having said this, my initial observations showed that these words were, and still are often used interchangeably. The result is a confusion of meaning. It must therefore be stated categorically that temptation is not sin. Furthermore popular culture has a warm fascination with the so-called ‘seven deadly sins’. Here temptation almost appears as a thing of promise, beauty, something to be consumed, entertained, indulged in, nurtured, and loved. This idea also forms the backbone of Richard Baxters’ 1656 work ‘The reformed Pastor’, which noted that grace and self-denial go hand in hand. Here self-denial is exhibited in the rejection of temptation which is empowered by the human ‘acts of gratitude and prayer’ (Barth). Other images which capture this idea are located in the ‘temptation of St.Anthony’. Salvador Dali’s 1946 surrealist depiction embraces this idea of rejection, sin, self-denial, grace and disturbance. Unlike Scylla, sin exists. However, Chrysostom’s idea has gravitas. Sin should be viewed artistically, as being like the Greek goddess Scylla who ‘with ten thousand hands lays hold of our thoughts, and comes on unexpected, tearing everything to pieces’. Ultimately, grace is God’s restorative yes to humanity, and His no to the destructiveness of sin (Barth).The former overcomes the latter in the victory of the Gospel. Sin is undone, the choice with regards to temptation is now clear (think Jesus’ example in the desert and the ephemeral nature of temptation’s promises). It is a very real act that involves ‘renunciation and pledge – command and obedience – faith and confession – moral disarmament and moral rearmament’ (Barth, CD.IV.4). It is a human response to the divine act on our behalf, which empowers us to rightly reject the denial of the other and the imposition of self. Where words fail, music succeeds (Hans Christian Anderson). Whiteheart express it well. Busch, E. 2008 Barth (Abingdon Pillars of Theology) (Kindle Ed. ). Abingdon Press. Available @: iTunes and Amazon.